CHINA BOOKS :: Deadly Medicines and Organised Crime How Big Pharma Has Corrupted Healthcare. How Big Pharma Has Corrupted Healthcare. How Big Pharma Has Corrupted Healthcare Gotzsche, Peter C.
PRESCRIPTION DRUGS ARE THE THIRD LEADING CAUSE OF DEATH AFTER HEART DISEASE AND CANCER. 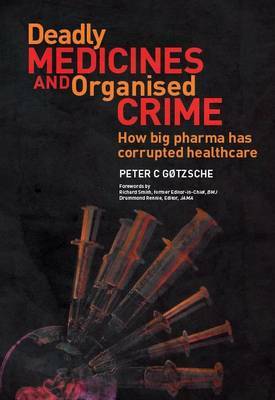 In his latest ground-breaking book, Peter C Gotzsche exposes the pharmaceutical industries and their charade of fraudulent behaviour, both in research and marketing where the morally repugnant disregard for human lives is the norm. He convincingly draws close comparisons with the tobacco conglomerates, revealing the extraordinary truth behind efforts to confuse and distract the public and their politicians. The book addresses, in evidence-based detail, an extraordinary system failure caused by widespread crime, corruption, bribery and impotent drug regulation in need of radical reforms. "The main reason we take so many drugs is that drug companies don't sell drugs, they sell lies about drugs. This is what makes drugs so different from anything else in life...Virtually everything we know about drugs is what the companies have chosen to tell us and our doctors...the reason patients trust their medicine is that they extrapolate the trust they have in their doctors into the medicines they prescribe.